A couple of weeks ago we had our regular Friday night D&D session with a new player coming to the table. Our group is still playing through Storm King's Thunder (nearly 3 years now), running around the countryside in chapter 3. They are in a home-brew session at this point, on assignment from the Harpers. 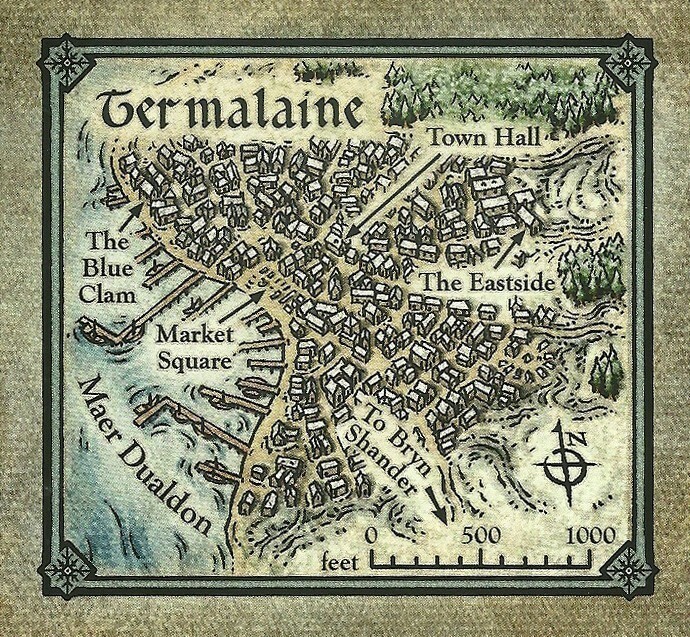 Our party was working their way up to Termalaine looking for four other Harper agents. When they arrived in the city they found it to be eerily quiet, with the gates swung wide open. Our monk shadow stepped his way into the city to investigate and found a city that was in ruins from a recent attack by a war party. The usual D&D banter and roleplaying ensued from there with several of the NPC's. What happened next though caught everyone at the table by surprise, including myself. I have been DM'ing for almost three years now, playing the same campaign in Storm King's Thunder with my Friday night group. Through all of that period I have gone back and forth on trying to keep myself organized as the DM. I have admittedly struggled to keep a good track of my notes through the campaign and in general. I have wanted to approach D&D in as analog a way as possible. I spend so much time online and on the computer as it is, bringing that to the gaming table seems counter productive. That being said, there is an endless amount of functionality that a laptop or note taking software brings to the table, that it would be foolish to try to manage all of it in paper alone. I have finally over the past year or so begun to develop a system that works for me on keeping track of my notes, etc. My first stop here is the use of a Tūl paper notebook. As I noted above I want to be as independent from the computer as possible at the gaming table and my quick reference notes during a gaming session are all being placed right into this paper notebook. I fund this Tūl system to be fascinating because of the ring bound sheets which allow you to remove pages and re-arrange them in any order. I have used spiral bound notebooks in the past and they have worked fine, but I have run into two primary limitations with them. 1) What to do when you have narrative or note changes that required you to re-arrange pages and 2) what do you do with the notebook if it is only partially filled and you are done with what you need with it? The Tūl notebook solved both of those problems for me and I picked up the smaller format size which works well for sitting at my side on the gaming table. The page size is exactly one half of a standard 11x8.5" page, so creating a few templates in Apple Pages is pretty easy and straight forward. I think I want to add some supplementary reference material to it as well, including some quick random tables along with a master index sheet for referencing back to the various books. 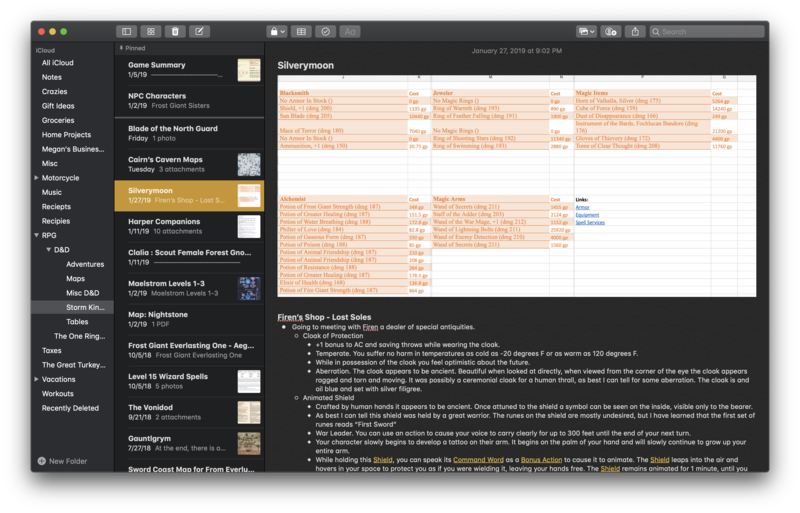 Apple Notes, and Evernote before that, are the cornerstone of where I keep track of all of my documents. In Notes, I have sub folders where I keep the text I write out along with .PDFs, images, and ideas for the campaign I am running. Up until recently, I was keeping a running campaign summary and NPC list in Notes, having that pinned to the top of my notes list. This worked well, but wasn't the best for quick reference during the middle of an active gaming session. I have moved more to a method of using Notes to capture my pre-session planning and ideas. What I have begun to do now is create a new note for each location or story plot and incorporate the relevant NPC's, and information needed for that section into that session. 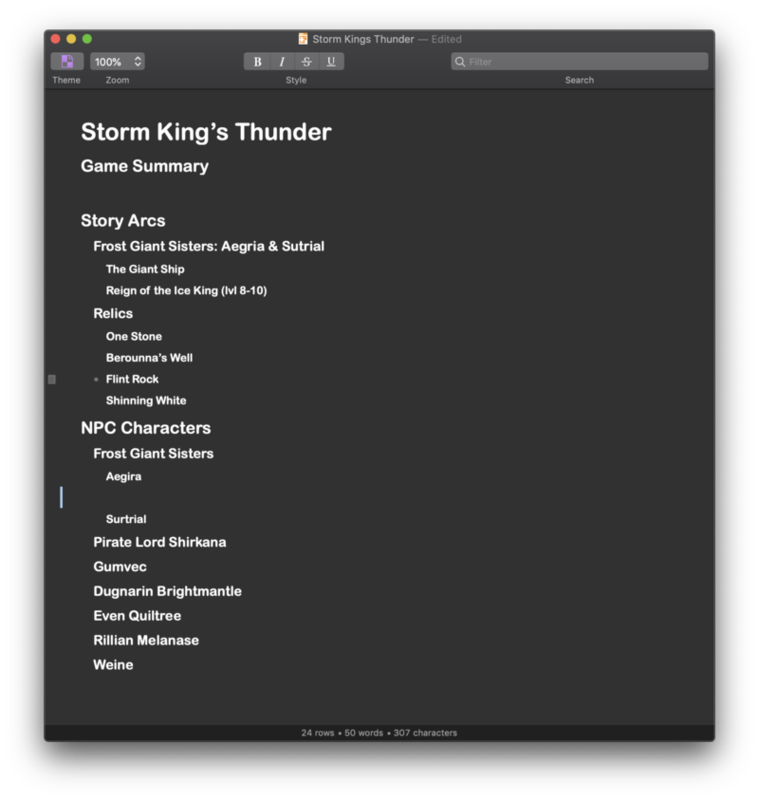 I am also using Apple notes to capture various D100 tables that I find online for adventure planning. Over the next couple of months I hope to begin development on some home-brew adventure planning. I feel my Ebenere Nanowrimo story for a few years ago would make for an excellent setting to place a campaign in. 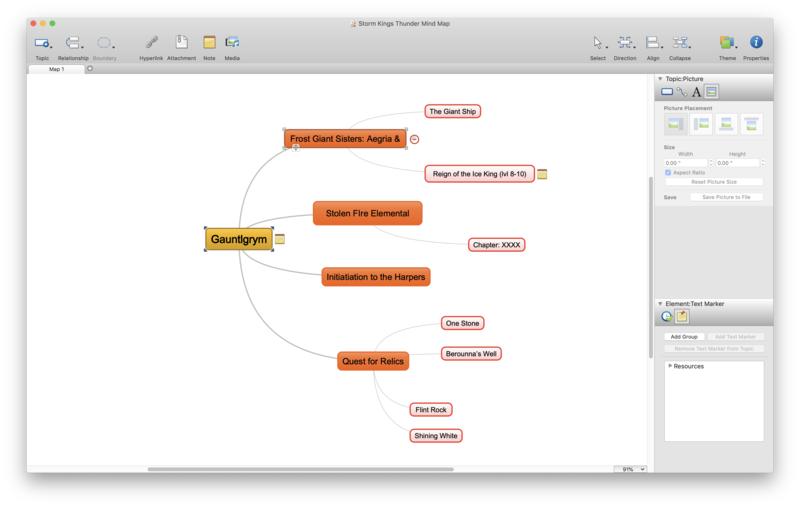 Mind mapping is one of those things that I can recognize the utility, but I haven't really taken full advantage of. I experimented with it a little bit for my current campaign, but I think it hasn't been successful because I didn't start using it from the beginning. The result is I haven't had a good amount of connecting ideas to develop with the narrative. You can see my poor mapping laid out below when I tried to pickup with our party in Gauntlgrym. Omnioutliner is a great outlining and note taking app. I anticipate this will also become a core component for my future home-brew campaign as I chart out future NPCs, characters, etc. You can see below my failed attempt at trying to keep track of items in it for the SKT campaign. Now, perhaps Evernote has been doing this for a long time and they are just now clarifying their practice. What is unfortunate though is that Evernote has now established a trust problem with its users. Evernote has been the better part of the past five years migrating their platform from a note taking application to a business collaboration platform. With that migration has come a rather hefty annual fee. The business account is $120 a year. I paid for that account because I liked Evernote and I prefer to pay for my services whenever I can. The problem though is that when you pay for a product or service you expect certain things in return. If Google or Facebook were to come along and state that their engineers were going to look at my data for their own uses I would be annoyed, but their services are free and they make money off of leveraging my data. Evernote is not that service. I am a paid user and when the service costs as much as it does I expect my data to be fully secure. They have courted businesses and it is not unreasonable to expect some of those businesses to now have confidential or proprietary information store in their Evernote accounts. Having any sort of direct access by any personnel at Evernote is just not acceptable. I would even expect these days that my entire Evernote database can be fully encrypted so no one at Evernote can ever access it. Not everyone may share my point of view, but I think it would be in Evernote's best interest to encrypt the data so even if law enforcement does come knocking with a warrant, they can simply say "We don't even have access to the data". Evernote's CEO posted a clarifying statement this morning, which I don't feel has clarified much. In the end I feel that Evernote's fundamental and core initiatives no longer match my own and what I want to get out of the service. It makes me extremely disappointed. I have been an Evernote user for more than five years now. I have everything from my grocery lists to tax information to my creative writing stored in there. They have continued to show that they are losing their way though. They have increased the prices of their service while not implementing features that have progressed the platform. Basic things such as a night mode for their applications, distraction free writing or even archiving of data just doesn't exist. When you have thousands of notes like I do then searching can become cumbersome. Just a few months ago I finally found a great writing application that uses Evernote called Alternote. That app is great, but now I feel like I can't really use it. So where does that leave me? At this point I am not sure if I can really stay with Evernote unless they come out and really change the course of their ship. Evernote's business account was nice because my business note and personal notes were kept completely separate. I feel like I will now have to bring my business notes over to Onenote. The question is where do I end up with my personal notes and writing? Right now I don't know. Apple's Notes app actually looks pretty robust and being an Apple users I think I can be fine living in that platform. That would solve all of my basic note taking needs. What it won't do is get me where I need to be for my writing. I want to have that minimal writing platform with a night mode. I may give Ulysses another look, something I was testing a few months ago. Another candidate though looks to be Bear. It is a really clean note taking interface and with a $15 a year subscription it seems affordable. Time will tell though as I begin to test stuff out over the next week.